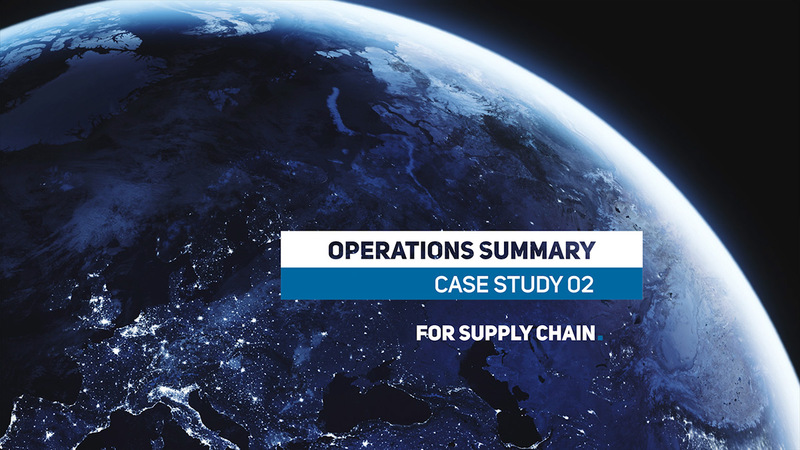 The Operations Summary is a complex overview of the functioning of logistics. On a monthly basis it monitors all important indicators as required by the client. For example cost of individual phases of logistics processes, load efficiency of trucks and other vehicles, timeliness and completeness of deliveries, implementation of financial plans and many other. This KPI reporting tool runs in a user-friendly MS Excel environment. We also service the report for our clients and update it on a monthly basis. For logistics to be effective, it is needed to ensure continuous data evaluation and high-quality visualization. With thousands of shipments, multiple types of transport and multiple transportation companies, it’s easy to get lost in hundreds of thousands of lines of data. Inconsistent and non-automated reports, where a single report tracks just one segment of the logistics process are not efficient and consume lots of precisous time of client´s employees. Operations Summary tackles the above mentioned challenges by interpreting all logistics data in a single file on a few sheets. That way the results are immediately comparable and comprehensible at any time. The report is automated and fully customised to client´s needs. It combines data from different sources in a way for which there is no module in the currently used database systems of our clients. Operations Summary consists of one reporting file for all KPIs and two service files – a data file and a computing file. As a result, nothing but clean data without formulas are incorporated into the resulting file. The file can then respond to any user queries within seconds, although it interprets hundreds of thousands of lines of data in thousands of ways. The data and computing modules collect data from different sources from client´s database systems and subsequently all calculations are performed. Each shipment is being analysed in order to calculate all KPI. Automated calculations link all information about type of transport, goods that has been transported, duration of the transport, service level, cancellations and above all the costs and extra costs associated with shipments. Subsequently we combine the data into logical data sets needed for KPIs tracking according to the client’s requirements. We also perform multi-level controls of the input and output data. In the next step the resulting data are uploaded to the reporting file of Operations Summary. 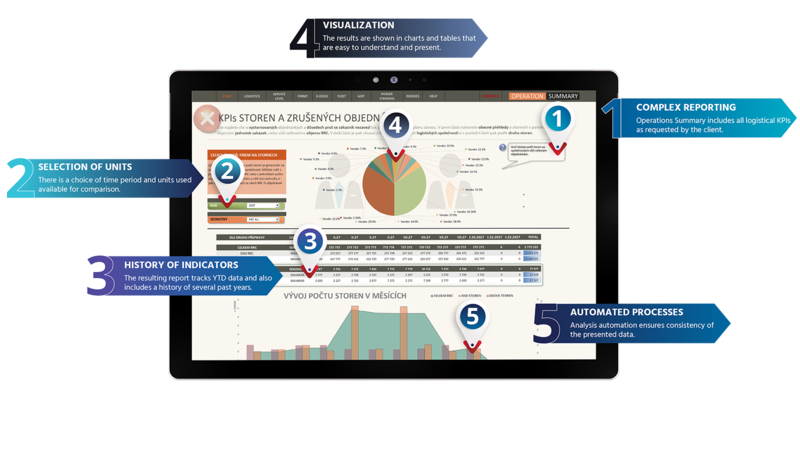 The client uses this KPI reporting tool as a fundamental report of KPI in logistics, both for evaluation of performance and for financial planning. Since a wide range of logistics data enters the Operations Summary KPI report, additional modules can be added to evaluate new indicators. We respond to the needs of our clients as they emerge. For instance, upon client´s request we have added a module for tracking non-deliveries in secondary transportation. KPI reporting solutions are an important part of our services. For our clients we have developed a number of complex, efficient and time saving solutions. We can name for example Customers Summary, Warehouse Summary or Orders and Deliveries Overview.